On a beautiful June Sunday Afternoon, there can be few finer places for an air display at Old Warden. This year, the main June Air Display celebrated the Light Aircraft Association, an organisation which helps not only pilots, but also those who build and maintain light aircraft of all ages. Many of the Shuttleworth’s own aircraft are maintain under the stewardship of the LAA so it is a highly appropriate place to celebrate an organisation that truly does help dreams take flight. Old Warden on a clear summer’s day could not be a better place to spend some time. There has been a great deal of investment at Old Warden in the past few months, and certainly the Visitors Centre and Hangars are starting to look much more youthful with new contemporary signage, paintwork and resurfacing work. June saw the return of the “LAA Party in the Park” Airshow which saw the Collection’s own collection of aircraft, often featuring some very rare and unique types, joined by a number of aircraft that highlight the important work of the LAA in making flying accessible. Though most visiting aircraft were related to the main theme, the Battle of Britain Memorial Flight’s Douglas Dakota III was something of an imposter. However, considering the date of the show, it was an appropriate addition marking the 71st Anniversary of the D-Day Landings. The Dakota opened the show with a series of energetic flypasts up and down the display line. Opening the show, and quite possibly the display of the afternoon was Rich Goodwin in his incredible Pitts S2S Special. Lightened and with a powerful engines, Rich’s Pitts looks stunning in its Union Flag colour scheme and is capable of the most extraordinary aerobatics leaving thick smoke trails in his wake. His knife-edge take off is simply just the start of the show which includes some amazing gyroscopic tumbles and towering vertical figures. Few aircraft optimise the work of the Light Aircraft Association more than the E-Go which was admirably demonstrated by Keith Dennison. Designed from the outset to be an affordable yet safe light sports aircraft, the quirky looking canard design is quite a performer showing off it very slow flying capabilities as well as agility, speed and relatively quiet engine. Of the same ilk, but from a totally different generation is the Druine D31 Turbulent which was also another of the visiting aircraft to be displayed. While it may prove to be less forgiving than the E-Go, the Turbulent was designed along the same lines and for many years has been a mainstay of the LAA and the Tiger Club. Flying alongside the Turbulent was the Tipsy Trainer, another homebuilt regulated by the LAA. A totally different LAA type visiting the collection was the Edgley Optica. Despite originally being superseded by helicopters for the observation roles it was originally intended, interest in the type is beginning to build again. In the hands of Francis Donaldson it is a great airshow performer with its unique and imposing looks plus some outstanding agility. The Collection’s own fleet of course played a major part. Early light and sports aviation saw the BAE Systems owned de Havilland DH60 Cirrus Moth join the collection’s DH60X Hermes Moth and Southern Martlet fly a gentle formation routine around the gorgeous blue skies over Old Warden. The Hermes Moth also flew as part of the traditional Shuttleworth Collection barnstorming display alongside the Miles Magister, Piper Super Cub and Peter Holloway’s Miles Hawk Trainer which sees limbo flying, balloon bursting and flour bombing. 1930’s Air Racing provided the collection with another chance to highlight its links to the LAA. Another of the visiting aircraft was the wonderful Travel Air Type R “Mystery Ship” replica which is one of the highest performing aircraft to be regulated by the LAA. 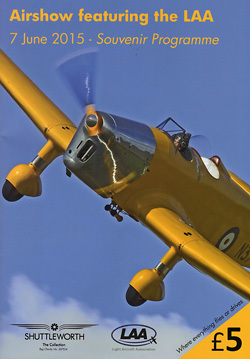 It flew alongside the Percival Mew Gull which was flown on the Cape Record by famous test pilot Alex Henshaw and is now part of the Shuttleworth Collection. Vintage glider displays have become a wonderful addition to Old Warden flying displays. Stalwart of these is the EON Primary Glider, perhaps the most primitive looking machine in the Shuttleworth Collection. More potent is the Fauvel AW36 Glider flown by Graham Saw. It’s odd flying wing shape belies its aerobatic capabilities which were fully demonstrated by Graham after release from the Piper Super Cub tug. Old Warden is one of the few places in the world you can see original and incredibly faithful reproduction First World War aircraft flying. Five such aircraft flew during the show with the orginal RAF SE5a, Avro 504K and Bristol F2b Fighter flying with the reproduction Bristol M1C and Sopwith Pup. Though there have been a number of restorations of Inter war period military aircraft in recent years, the Shuttleworth Collection remains perhaps the only place you see aircraft from this era flying regular. In a section dubbed “Silver Wings” the Hawker Hind and Gloster Gladiator I provided a fine demonstration of the type of aircraft that were in service through the 1930s right in the early stages of the Second World War. An unusual Second World War scenario was played out by Peter Holloway’s Fiesler Storch and the collection’s own Hawker Sea Hurricane Ib. While flying a typical observation mission, the Storch was bounced by the Hurricane. While it may seem rather one-sided, the Storch could use its very slow flying abilities and agility to avoid the gunsights of the Hurricane travelling at much high speed. While the blue skies and puffy white clouds were perfect, it remained breezy and the winds were judged to be a little too much for the Edwardians. Instead, the Shuttleworth Collection rolled out the de Havilland DH88 Comet “Grosvenor House” which provide a surprise highlight to end the days flying. The Comet is an outstandingly beautiful machine and was shown off to its best by the Collection’s chief pilot “Dodge” Bailey. Old Warden is just such a pleasant place to be; great surroundings, relaxed atmosphere and always such well-run events. Add in some very quirky and interesting aircraft then you have no better place to be in the world for an summer air display.